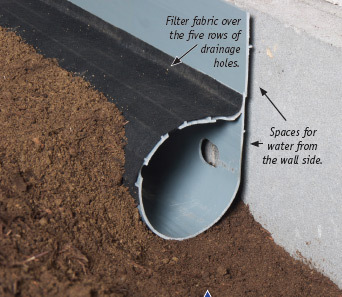 SmartPipe's™ custom design has holes on the top and front under a filter fabric, to accept water from the soil and the surface of your crawl space. There is a special flange with spacers on the back, and large holes to accept water from the crawl space walls and the footing/ wall joint. Do you have a wet crawl space? Have you noticed standing water on the crawl space floor, water signs on your walls, or muddy soil in a dirt-floored crawl space? If you answered “yes” to the questions above, you probably need a crawl space drainage system. In a dirt-floored crawl space, ground water leaks into the crawl space through the soil, creating a muddy mess. When water leaks into a crawl space with a concrete floor, it comes through cracks in the floor or through the gap between the floor and the foundation wall. In rainy weather or during flood conditions, water can leak into the crawl space through openings for crawl space vents and crawl space doors. Plumbing leaks in the crawl space and condensed moisture are other sources of crawl space moisture. No matter how water leaks into your crawl space, it’s important to drain the water out so that this area can stay dry. A dry crawl space won’t attract mold and mildew, two types of fungi that can cause wood rot while also creating indoor air quality problems. 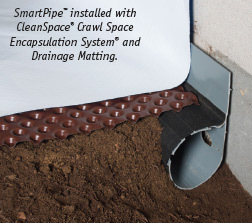 The CleanSpace® System can be fitted on top of the SmartPipe™ System — and your crawl space water and moisture problems — and the bad effects and worries that go with them — go away! The type of drainage system used in a crawl space depends on conditions in the crawl space. At least some of the following components will be necessary. Drain pipe. SmartPipe™ drainage pipe from Basement Systems is the best type of drain pipe to use in a crawl space with a dirt floor. Thanks to its unique “d” profile, SmartPipe™ can collect water from foundation walls and from a dirt crawl space floor (see photo). If the crawl space has a concrete floor, either WaterGuard® or DryTrack drain lines are recommended. Crawl space sump pump. Unless your crawl space drain lines can be pitched to drain water outside the foundation, a crawl space sump pump will be necessary. Crawl space drain lines will carry water to a sump pit installed in the crawl space floor. From this collection point, a sump pump will automatically discharge water to the exterior once water reaches a certain level in the sump pit. Drainage matting. This dimpled plastic mat material is often installed over a dirt-floored crawl space to create a drainage space that helps water find its way to your drain lines. Waterproof membrane. This durable moisture barrier is installed during the crawl space encapsulation process. It helps to direct water toward crawl space drain lines, while also keeping the crawl space interior dry. Crawl space vent covers and doors. To prevent water from leaking into the crawl space through open vents and standard crawl space doors, it’s best to seal these openings with gasketed, waterproof covers such as the EverLast® vent covers and doors available from Basement Systems.